I got this book for Christmas and although I read Googled first, I was excited to get into this immediately after. Covering the US animation scene from its beginnings to sometime in the late 1990s, I found Serious Business to be an interesting and enjoyable read. Author Stefan Kanfer focuses more so on the Golden Age of animation than any other time. Perhaps because that was when animation was big business in Hollywood, when numerous major studios and Disney ran full-scale animation departments. I thoroughly enjoyed reading about how the Fleischer Brothers got up and running in New York, or how Walt Disney spent his last few dollars on a 1st class train ticket to Los Angeles. The book tends to read rather quickly after around 1950 or so. Although this in understandable given the downturn in the industry at the time. It was nice to see attention paid to studios such as UPA and the Hubleys as well as the various independent animators who sprouted up throughout the 60s and beyond. Once we reach the 90s, things pick up again with the advent of the Simpsons and the creation of the three original Nicktoons. The book then somewhat bumbles along to the end in 1998 or so. Not that this detracts from the book, indeed, I am far more familiar with recent developments than those in the 30s, so unless you’re Jerry Beck and have a thorough knowledge of old cartoons, you are unlikely to be worried either. Kanfer writes with a writing style that can be at times a little long-winded, but the book is never boring and with so much material to cover, the book is indeed dancing the line between covering to much yet covering too little. At 264 pages, it could easily have been a bit longer, although Kanfer may have intended it to be this way, so as not to descend into the kind of tome one would expect a serious historian to have. 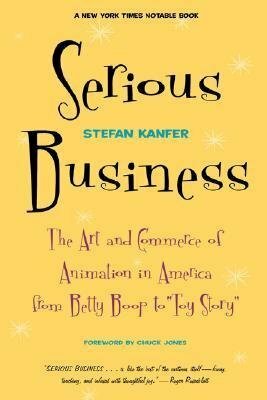 Serious Business is well worth a read, especially if, like myself, you were not as familiar with the beginnings of the animation industry as you would like. In conjunction with the Giant 600 Cartoon DVD boxset I also received, it is fair to say that the book indeed sparked my interest in old, cartoons long forgotten by the general public.